Understand where and why check valves are used. The different types available and how they work. 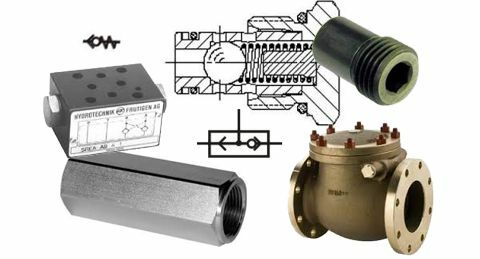 Check valves are used for a wide range of different functions. The type of check valve will vary with different equipment and flow rates. The name can also change as they may be known as anti-siphon, non-return, bypass, load holding, PO check, one-way plus a few others. Check valves only allow flow in one direction to provide a range of sequencing or safety functions. Anti-syphon check valves are placed in return lines to stop fluid draining out of the reservoir when valves are removed for maintenance. Check valves with springs can be used as simple, low-pressure relief valves although they don't have a good pressure rise rate characteristic. Typical applications may be a filter bypass valves. They can also be used to maintain slight back-pressure on systems if required for control purposes. PO check valves are commonly used for load holding e.g. locking a cylinder in position so that it does not move once the directional control valve or supply pressure has been switched off. Check out our 'understanding load control' course or circuit simulation to learn more. Shuttle valves are common in load sensing, pilot line feeds or pressure switching circuits. When arranged in numbers, PO check valves can be used as directional valves when very low leakage is required. Also when very high flows are required they may make an alternative to a large directional valve. In these applications, they are normally called logic valves. More details on this are covered in our logic valve training modules. Low-pressure relief or filter bypass. Holding loads with minimal leakage. Check valves only allow fluid to flow in one direction. When pressure is higher on the ball side it pushes the ball or poppet against the spring and opens a path for the fluid to pass. When pressure is higher on the spring side the ball or poppet closes against the seat and flow stops. The spring force determines the pressure difference at which the valves start to open. There should be virtually leak-free sealing of flow in the other direction. Pilot operated check valves (PO checks) have the facility whereby an external pressure can be used to open the valve to allow flow in either direction. Shuttle valves have two seats and three connecting lines. They always feed the highest pressure from either of the feed lines back into the sense line. A shuttle valve feeds the highest pressure from either of two supply lines, back into the T line. Shuttle valves may be used within a daisy chain of valves to feed the highest of many lines back into one. Shuttle valves are commonly used as cartridge inserts or line-mounted valves. They can, however, be very difficult to spot as they can be hidden inside manifolds or look just like line mounted fittings. Check valves are sometimes also known as non-return, one way, anti-siphon, backflow prevention and flap valve. Check valves can generally be purchased with a range of spring setting. Check valves without springs provide less resistance and therefore pressure loss. Pilot-to-open (often called pilot operated) check valves allow flow in both directions (backward through the valve) when a pressure is applied to the pilot line. Pilot-to-close check valves will not open in either direction when pressure is applied to the pilot. Other types of check valves include mechanically operated or vented. Check valves come in a wide range of formats and installation styles. These include line mounted, cartridge, CETOP mounted, sandwich plate and flange inserts. Learn more about check control valves in our 'Professional Training Section'. Understand their design features, performance limits, and how to specify check valves.